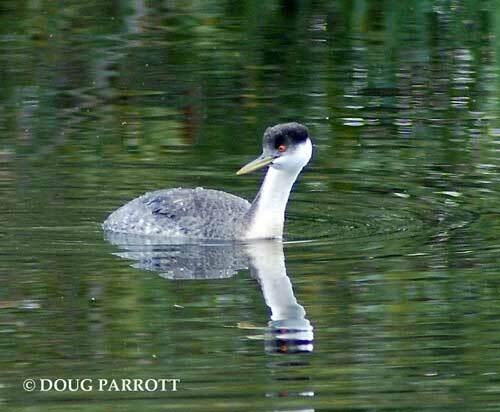 My favorite Western Grebe motored over to the Montlake Fill this week to fish in the Lagoon (the westernmost water body on the site). I was very glad to see him again. I think he’ll probably stick around here for the winter. I first saw this fellow three years ago as he was paddling westward beside the floating bridge. Western Grebes are not very common at the Fill, although a wintering flock has gathered for years at the north end of the lake a few miles away. I keep my eyes open for one because I like to keep records of bird species at the Fill. This site has been birded since 1895, and I am one in a long line of records keepers. Anyway, three years ago, the Western Grebe I spotted was behaving in a most unbirdly fashion. It was making a beeline westward, clearly paddling with some purpose in mind. The purpose turned out to be fishing in the Lagoon at the Fill, almost a mile away. The thing that struck me about this was how long the grebe kept its destination in mind. It took about 20 minutes for the bird to swim from the bridge to the Lagoon. In all that time, it never wavered from its purpose. I’m not sure, at my age, that I could keep one thing like that in mind for as long! As I get older, I find myself more easily distracted from whatever it is I am doing, and then when my mind drifts back to its original thought, I can’t remember what it was I wanted to do. “Why did I come into this room?” I often ask myself. Maybe, instead of being so proud of how smart we are as a species, we should all wish for bird brains. This entry was posted in Uncategorized on October 13, 2011 by constancesidles.